EMPEROR is a film set in the days immediately following the Japanese surrender at the end of World War II and is based on the book "His Majesty’s Salvation" by Shiro Okamoto. It follows the true story of General Bonner Fellers (played by Matthew Fox) who is working for General Douglas MacArthur (Tommy Lee Jones) as a Japanese expert. He is tasked with investigating what role Emperor Hirohito had to play in World War II and whether he should be tried as a war criminal. Interwoven with this is Fellers’ emotional search for Aya, a Japanese exchange student he met years earlier. 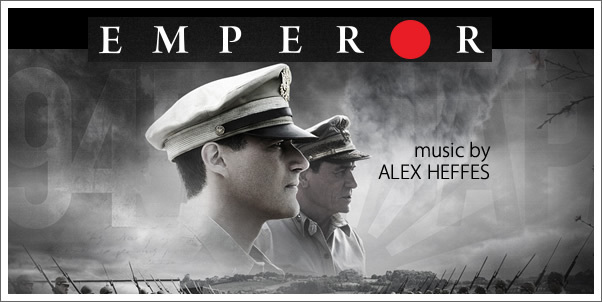 EMPEROR was scored by ALEX HEFFES, a British composer mainly known for his work in TV and documentaries. However, in more recent years he has become a more recognised face in film by providing critically acclaimed scores for films like THE LAST KING OF SCOTLAND (2006), STATE OF PLAY (2009) and THE RITE (2011). This is mainly in part to his ability to write for a full orchestra with interestingly melodies – something we’re finding more of a rarity in Hollywood these days. So it’s great to see Heffes’ use these talents again here.